It was their parents’ idea that they enter a contest held many years ago at the Overton County fairgrounds. The older boy was just 14 years old and his younger brother was only 12. The prize money to be given to the winning contestants was a lot of money back then, every bit of $80.00. But when the family got to the fairgrounds and the boys got a look at the much older and more experienced musicians they were up against, they began to have second thoughts. And had it not been for their parents just absolutely making them go ahead and enter the contest, both the boys would have turned around and gone back home the minute they got to the fairgrounds. But as scared as they were, and because they were made to go ahead and enter the contest, they did. No one could believe the results. Out of all the contestants who entered that day, those two young boys won. They later used that prize money to buy a brand new guitar. And that’s how the musical career for the Sullivan Brothers began. But it really started even before either Joel or Hollis knew how to play any kind of musical instrument. The Sullivan Brothers, Joel, age 15, and Hollis, age 13, are ready to perform. Joel, born in 1939, Hollis, born in 1942, and the youngest son, Wayne, born in 1953, some 14 years after Joel, were the sons of Coy Sullivan and wife Modean (Johnson) Sullivan. Because Wayne was so much younger than his two older brothers, his involvement with the Sullivan Brothers band was limited. However, he has been very much involved in music during his life, and has been a member of various bands over the years. Coy and Modean Sullivan started their married life together in the area of Livingston Boat Dock, now known as Mitchell Creek Boat Dock. Coy made a living for his family by farming. When Joel was around four years old, the Sullivan family moved to a farm in Rickman to be closer to Modean’s parents. Since music was something Coy was always interested in, he learned to play the guitar. It was Coy who taught Joel how to play three chords on the guitar. When Hollis and Joel were still quite young, family, friends and neighbors would often gather at the Sullivan home just to listen to Hollis and Joel sing. Hollis was gifted when it came to being able to remember the words to a song. After hearing a song only one time, from that point on, he never forgot the words. As their interest in music grew, the boys bought many of the Stanley Brothers records from Annie and Bush Taylor’s shop on South Church Street in Livingston. Each time Hollis listened to one of Stanley Brothers recordings, he immediately memorized the words. The original old log house the Sullivan family lived in had no electricity or running water. Since they had no car, they came to the store in Rickman by mule and wagon to buy or swap for their staple items. Eggs would sometimes be traded with the store owner for sugar, salt, or flour, and if there was any money left over, Joel and Hollis would get a popsicle or candy, but sometimes they used the extra money from the eggs for shotgun shells. The Sullivan family later moved to a farm just off of old Highway 42 in Rickman. It was on the porch of this home that many people gathered every weekend to listen to or participate in the hundreds of jams sessions that have taken place over the years. Listening to Bill Monroe performing on the Grand Ole Opry by way of WSM radio was a regular routine for the Sullivan family. Since they had no electricity, the radio they had operated on a battery. Many of the Sullivan families around the Rickman area had quite a few children, so it was nothing unusual for many of the relatives to all gather together around a large wooden table that could seat twelve or more people in one of the Sullivan homes. Joel remembers these gatherings as being wonderful times. Joel began to play the guitar when he was around seven years old. Around that time, Hollis decided he would try to learn to play the mandolin. One was ordered for him from Sears and Roebuck, but after a while, Hollis became discouraged, and decided to go with a guitar. Joel showed him how to play those same three chords their father had taught him earlier. As soon as the boys got home from school, they would spend an hour or two every afternoon picking and singing. It was always Bill Monroe, Lester Flatt and Earl Scruggs, or Jimmy Martin type music they sang and played. Around the time Joel was thirteen and Hollis was eleven, they began playing on a thirty minute program on Saturday afternoons called "The Farm Parade" broadcast on WHUB radio in Cookeville. Tom Harris served as the announcer, and the program was sponsored by Clarence Stewart Auto Sales. Hollis and Joel sang and played on this program, but occasionally Joel did an ad for Clarence Stewart, and even did a weather report from time to time. He said he got in a lot of trouble over doing an ad for Clarence Stewart once. The person who bought one of the cars he advertised had trouble with the vehicle right after buying it. Joel still remembers how upset the man was and how he was blamed for whatever turned out to be wrong with the car. The famous Mac Wiseman heard the Sullivan Brothers play and wrote a letter inviting them to be guests on his show. The day the letter came, Joel’s father and some other fellows were sitting on the store porch just across the road from the post office in Rickman. When Joel came across the road with the letter, none of the men sitting on the porch believed him when he told them the letter was from Mac Wiseman. It was only after the letter was passed from one to the other that they realized he was telling the truth. It was in November of 1956 when Livingston’s radio station, WLIV, began broadcasting. The very first live band to play on WLIV was the Sullivan Brothers. Their thirty minute program was called "The Sullivan Brothers Show," and the group then consisted of Jimmy Newberry on the mandolin, Hollis on the guitar, Joel playing fiddle, and Carl Bowman on the bass. 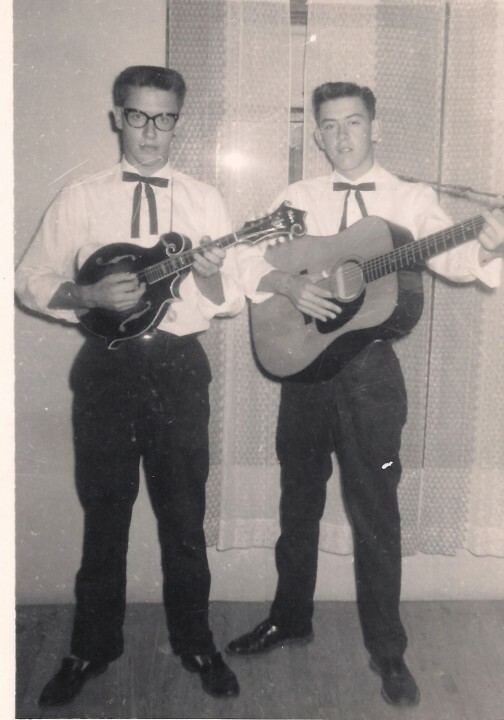 It was Jimmy Newberry who taught Joel how to play a mandolin. During the time the Sullivan Brothers Show was on the air, Joel joined the army, but would often hitchhike back home on weekends so he could play on the radio show. Many of those weekends Joel was in service, the other guys in the group would find him waiting for them at the radio station, arriving there before they did. In addition to radio stations WHUB and WLIV, the Sullivan Brothers also had a show on WNOX in Knoxville. The Noel Ball Show broadcast from Nashville television station Channel 8 was another place the Sullivan Brothers performed. Even during the time Joel was in service, he was always involved with music and often played with a group while still in the military. He played with western swing bands while living in Arizona, and over the years, he has mastered the fiddle, the mandolin, and the guitar. In 1962, Joel married the love of his life, Sue, whose maiden name also happened to be Sullivan. They were living in Arizona when their oldest daughter, Tammy Lynn, was born. For a while, they considered making that state their permanent home, but missing family members and the love of the Tennessee hills soon brought them back to this area. After returning to Tennessee, two more daughters, Teena Kay and Wendy Michelle, were added to their family. All three daughters and their families continue to live on the old Sullivan home place in the Rickman community today. Hollis and wife, Carolyn Ferrill, had one daughter, Linda. Their family now includes two grandsons. For many years here in Livingston "The Place" to go every Saturday night was the VFW building on South Church street. That was where square dancing would be held until the late night hours. It was also the place where a band composed of Ronald Bilbrey, Hollis, Joel, and Freeman (Red) Wilson played for around ten straight years. It was through playing with that band that Joel helped to buy groceries for his family all those years. He took the twenty-five dollars he was paid each weekend and used the money for that purpose. His regular job was working at Acme Boot in Cookeville, one of the few places in this area that had a union. He worked there for twenty years. One year in Cookeville, a Bluegrass music festival was held, with WSM’s well known announcer, Grant Turner, hosting the event. Joel happened to be attending that event, but was in the audience on this occasion. When Mr. Turner began his part of the program, he commented on how he used to travel from Knoxville to Nashville, and while on the road, would tune into WHUB radio to listen to The Sullivan Brothers Show, something he enjoyed very much. Later that same night, Joel had the opportunity to introduce himself to Mr. Grant, explaining that he was one of Sullivan Brothers. When Mr. Grant asked him which one of the Sullivan Brothers he was, Joel replied, "The Pretty One." A later photograph taken of all three Sullivan Brothers. 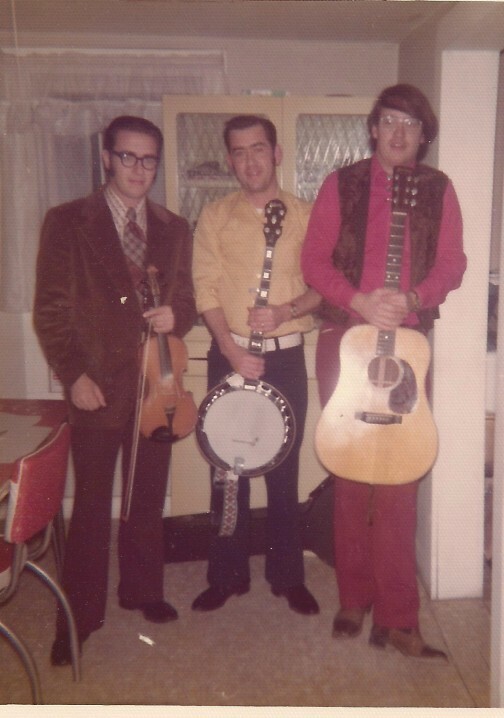 Left to right, Joel, Hollis and Wayne. In spite of the untimely death of Hollis in 1997, at age 55, Joel’s love of music continued. Over the years, he joined up with several different groups including Southern Express country band, Grass of ‘82, Blue Shadow, and Clearview. The group, Clearview, has really made a name for themselves in this and the surrounding areas. In April of 2008, they were asked to open a show in Tazewell, Tennessee for Jamie Dailey and Darrin Vincent. Joel tells me this group is today’s top bluegrass band in the nation. Clearview was also invited to spend four days in the South Carolina home of race car driver, Cale Yarborough, and while there, did three shows for him. The famous retired baseball player, Bobby Richardson, was also a guest in the Yarborough home during Clearview’s visit. On September 27, 2008, Joel was the recipient of the Algood Bluegrass Music Festival Hall of Fame Award. Each year, the person to be presented with this award is voted on by the fans attending the music festival. Joel told me he felt very honored to have been selected for the 2008 award, and considers this recognition even more special because it is the fans who decide the person most deserving. 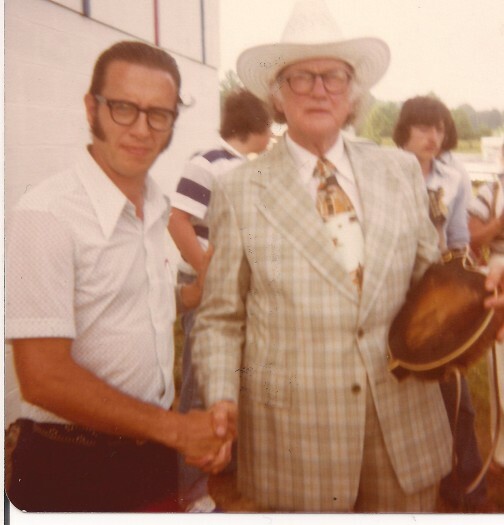 Joel Sullivan poses with Bluegrass legend Bill Monroe in Rosine, Kentucky in May of 1977at his Homecoming Bluegrass Festival. For the past five and one-half years, Joel Sullivan has been on the road somewhere every weekend playing bluegrass music, but this winter, he decided he needed a break. Joel’s wife, Sue, would often pack the van they traveled in with a lot of good home cooked food she had taken the time to prepare for their road trips. However, with today’s travel expenses and the recent changes with the economy, Joel decided just to take some time off. He isn’t sure this is a permanent situation, and more than likely, he’ll get a call and decide to get out the old mandolin once again. He and Sue enjoy being a big part of their children and grandchildren’s lives, and all family members are active in the church they attend. Retirement keeps both Joel and Sue pretty busy. Sue is an avid quilter and also does a lot of crocheting and embroidery work, something she really enjoys since retiring from jobs she’s held outside the home. The Sullivan Brothers’ musical career has been an interesting and very successful one, but I have to wonder what would have happened if Mom and Dad left the decision about entering the contest at the fairgrounds up to their sons all those years ago. Had they allowed them to turn around and go back home, would that have made any difference at all as far as where the road took them? There’s no way to know the answer to that, but if those two scared little boys could have had a tiny little glimpse into their future the day they stood on the stage at the fairgrounds, I feel sure waiting to see how the days and years ahead was going to unfold would have been a very hard thing for them to do. Click below to hear songs by The Sullivan Brothers recorded in the early 60's.